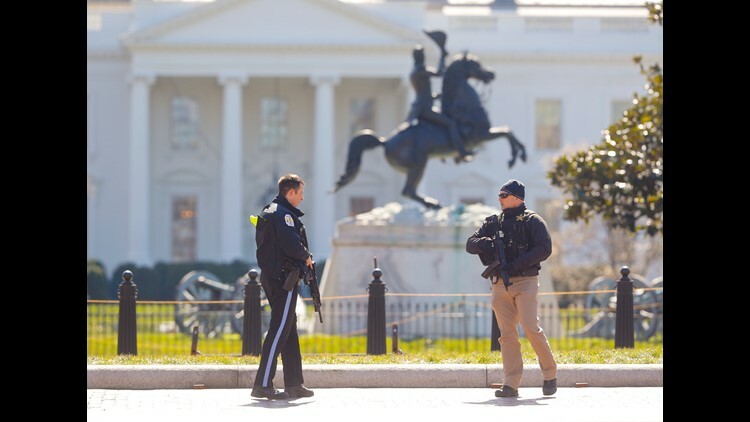 Law enforcement officers at Lafayette Park across from the White House in Washington, close the area to pedestrian traffic, Saturday, March 3, 2018. A man apparently shot himself along the north fence of the White House midday, according to the Secret Service, which also said he was being treated for the wound. A Secret Service agent traveling as part of President Donald Trump's security detail died Tuesday in Scotland after suffering a severe stroke. The Secret Service said in a statement the agent died Tuesday morning surrounded by family and coworkers — his "extended Secret Service family." His name was not immediately released to allow for notification of family and to respect their privacy. Trump arrived in Scotland Friday evening to massive crowds of protesters. He stayed at his Turnberry golf resort in between a NATO summit in Brussels and a meeting with Russian President Vladimir Putin in Helsinki. The agent, a 19-year veteran of the agency, suffered the stroke on Sunday and was treated in Scotland. The Secret Service said the agent was a "dedicated professional of the highest order" and thanked the medical personnel who gave him "exceptional care and support." The Secret Service has about 3,200 agents. The agency lists 36 agents on its "Wall of Honor" who have died in the line of duty since 1902. The last death listed on the wall is Christopher Smith, who died of a heart attack in 2005. Banke International director Niraj Masand, far left, poses for a photo with Eric Trump, second left, Banke International director Porush Jhunjhunwala, center, Donald Trump Jr., second right, and DAMAC Properties chairman Hussain Sajwani, during festivities marking the formal opening of the Trump International Golf Club, in Dubai, United Arab Emirates on Feb. 18, 2017. Two of U.S. President Donald Trump's sons arrived in the UAE for an invitation-only ceremony Saturday to formally open the club. In this Wednesday, Aug. 9, 2017 photo, staff prepare the dinning area at the Trump International Golf Club clubhouse in Dubai, United Arab Emirates. A Dubai billionaire who built a Trump golf course in the United Arab Emirates now wants to seek more business abroad. Hussain Sajwanis recent trips to Croatia and Malta more resembled visits by a head of state than those of a real estate developer. President Donald Trump's sons arrived in the UAE for an invitation-only ceremony Saturday to formally open the club. Secret Service traveled with the Trumps. President Donald Trump walks across the tarmac before boarding Air Force One at Hagerstown Regional Airport, Aug. 18, 2017 in Hagerstown, Md. Trump is returning to Bedminister N.J., after having a meeting with his national security team at Camp David, Md. President Trump is spending part of the summer at Trump National Golf Club in Bedminister. A Coast Guard boat is seen patrolling in front of the Mar-a-Lago Resort where President Donald Trump is staying for the weekend on Feb. 5, 2017 in Palm Beach, Florida. President Donald Trump is scheduled to leave tomorrow. President Donald Trump and first lady Melania Trump depart after Easter services at the Episcopal Church of Bethesda-by-the-Sea onApril 16, 2017 in Palm Beach, Fla.
Tiffany Trump, daughter of President Donald J. Trump, during her holiday in Capri Island, Italy on July 10, 2017. Tiffany Trump was traveling with her mother, Marla Maples. She also made a trip to Berlin with her boyfriend in June. President Donald J. Trump, First Lady Melania Trump and their son Barron Trump walk outside the Oval Office to depart the South Lawn of the White House by Marine One, in Washington, DC on June 30, 2017. Trump travels to Bedminster, New Jersey. Eric Trump and his wife Lara attend the opening Trump Turnberry's new gold course the King Robert The Bruce course on June 28, 2017 in Turnberry, Scotland. Police stand guard outside of Trump Tower on Aug. 4, 2017 in New York City. Following a dispute with the Trump Organization over a lease, the Secret Service, which protects all US presidents, has moved to a small trailer on a side street outside of Trump Tower. The federal agency had been renting office space in Donald Trump's Midtown Manhattan skyscraper since 2015 before a disagreement over the terms and costs for rent for a command post. Members of the Secret Service walk in front of Trump Tower on Aug. 14, 2017 in New York City. Security throughout the area is high as President Donald Trump is expected to arrive at his residence in the tower later today, his first visit back to his apartment since the inauguration. Left to right,Tiffany Trump, Eric Danziger, Datuk Tony Tiah, Datin Alicia Tiah, Joo Kim Tiah, CEO of the Holborn Group; Donald Trump Jr., his wife Vanessa Haydon, Eric Trump, and his wife Lara Yunaska cut the ribbon during a ceremony inaugurating the Trump International Hotel and tower in Vancouver, Canada, on Feb. 28, 2017.